When all is said and done, there has to be an exchange of currency. Your currency is your voice. The client’s currency is money. Ideally, what we’d all like is simple: fair exchange, no robbery. But we also know, more often than not, that ain’t the way this cookie crumbles. I am constantly searching other VO talent websites and rate sheets and the rate sheets from professional studios and the union to make sure my rate sheet is up to date and still competitive with others in our field. I use a professional website to send out my invoices so they look as professional as the audio I record. I do recommend setting up a partial payment from the client before beginning a project with the balance due when the project is completed and approved by the client. One thing is certain, though—the internet has woven such an all-invasive web that what used to be the exclusive preserve of a chosen few who lived and worked in the right places, is now equally accessible to everyone wherever they may be—from a small home in Boise, Idaho to a fashionable studio on the Sunset Strip in LA. 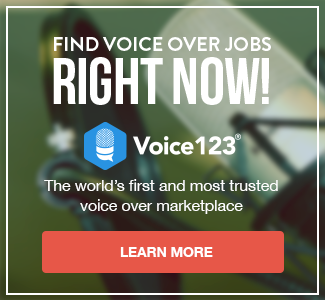 How to make a living with one’s voice is one of the most popular discussion topics on the web, and understandably so. Trepidation, uncertainty, and fear are great content generators, so in this chapter, let’s see how far we can go to allay your fears and give you the confidence to get out there, put your engaging pipes to good use, and make some money doing it. The world’s your oyster—and don’t you forget it! There is a lot of competition, but if you strive to work hard on your craft, get coaching, use quality equipment and give each audition your all, you will land jobs.